It’s 25 years since Dean Barton-Smith, Member of the Order of Australia, became Australia’s first deaf Olympian at the Barcelona Olympic Games to compete in the gruelling event, the Decathlon. Dean has also competed in four Deaflympic Games and two Commonwealth Games. 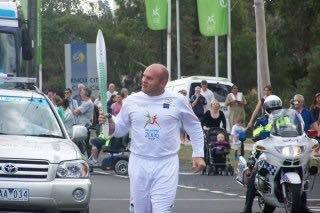 At just 17, he first competed in 1985 Deaflympics (Los Angeles, USA), then in 1989 (Christchurch, New Zealand), 1993 (Sofia, Bulgaria) and 2005 Melbourne, Australia, where he was honoured to be selected as the Male Team Captain of the largest Australian Deaflympic Team in history. “My sporting career has been a roller coaster. I started doing athletics, amongst other sports, when I was seven years old. Even though I was brought up in a mainstream education (that didn’t provide any communication access whatsoever – so my school grades were rarely above average) I was able to perform well in the sport. It was my escape – and especially helped me escape from bullies too. ‘Who says deaf people can’t do anything? Think again.’ – Dean Barton-Smith at the 1992 Barcelona Olympic Games. My career highlight is without a doubt when I finally made the Australian Team for the 1992 Olympic Games (Barcelona, Spain) in my chosen event – the Decathlon, becoming the first Deaf Australian to achieve such a feat in this event. There were a lot of people who didn’t have faith in my capabilities because of my deafness. I also knew many other deaf people were being oppressed because the focus was often on what they can’t do, rather than what they can do. That’s why I decided to do something a little cheeky, and wear a specially designed T-shirt that showed my deaf pride. I knew it would attract the media. We have a great story to tell as deaf people. It is not just what we say to the media, it’s how we say our story that makes for interesting media stories. 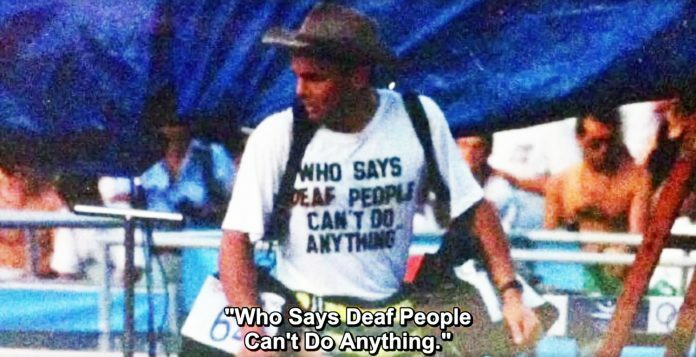 I did not realise that the image went worldwide and I’m often still reminded to this day from deaf adults who remembered ‘that T-shirt’. I got so many letters from around the world simply thanking me for giving them hope. I still treasure those messages to this day. The best thing about being a deaf sportsperson is you are always testing yourself not just against your deaf peers but also against your hearing peers. I probably wouldn’t have achieved the same feats if I wasn’t deaf because I wouldn’t be faced with people preventing me from achieving my dreams, making me more determined to prove to myself and to them what I am capable of. 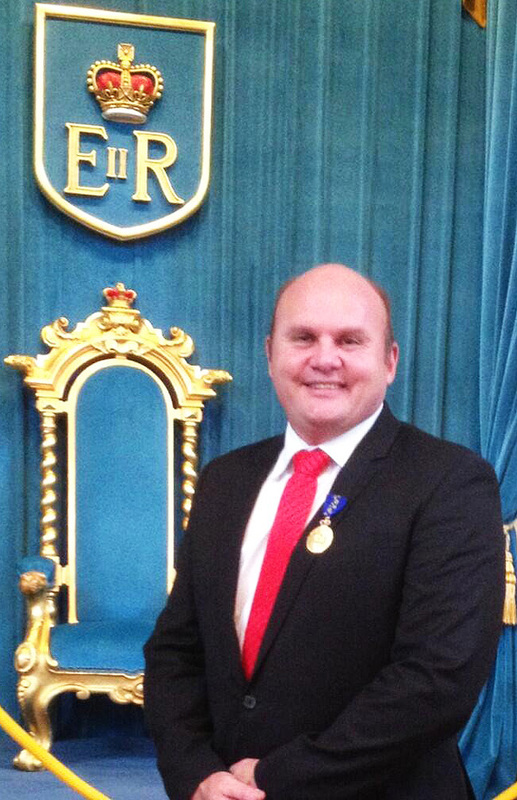 Presented with the Member of the Order of Australia (AM) award on Australia Day (which was extra special), I noted I was recognised not only for reaching the pinnacle of world sport as an athlete but also for my services in helping the deaf community pursue their sporting dreams. 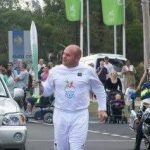 See a post published by Australian Olympic Committee about Dean and his Member of the Order of Australia (AM) award – tap here. 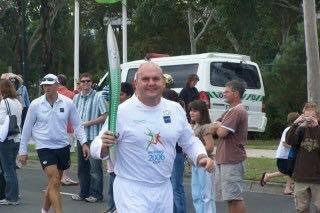 Dean has partaken the Sydney 2000 Olympic Torch Bearer and 2006 Commonwealth Games Baton Relay. Dean Barton-Smith with Queen’s Baton Relay for Commonwealth Games. 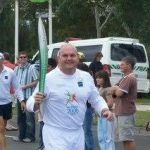 He’s also been Director of the Board of Deaf Sports Australia, later becoming Founding Chairperson of the Melbourne 2005 Deaflympic Games. He provides high-level advice to Athletics Australia for International Tours such as Olympic and Commonwealth Games, World Championships, amongst others. He’s also been asked to be Chair of the Athletes Commission for the International Committee of Sports for the Deaf which was newly formed and a very important cog for the Deaflympic / Deaf Sports Movement to ensure deaf athletes have a voice around the globe. Australian Federation of Disability Organisations President, Dean-Barton Smith fires up the NDIS rally in Sydney – 30 April 2012. 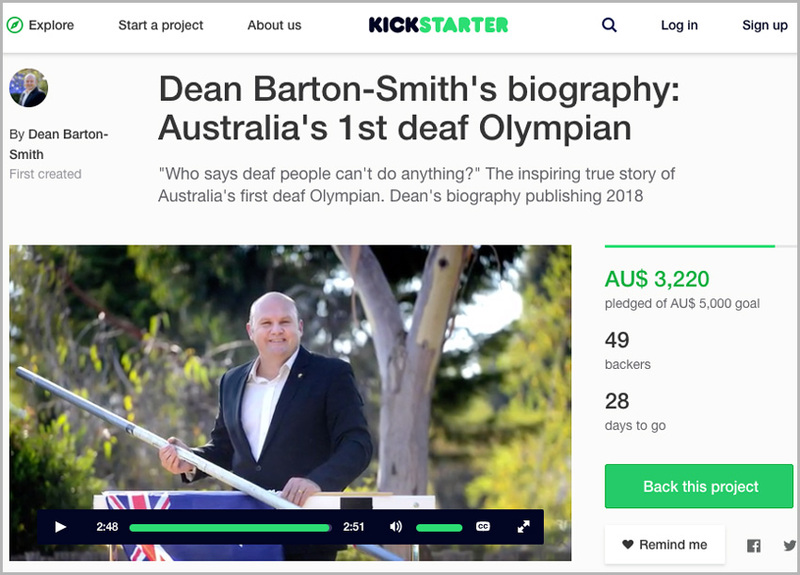 Can you help Dean to publish his biography – the inspiring true story of Australia’s first deaf Olympian? Check out Dean’s campaign on Kickstarter! Dean hopes to achieve with publishing this book, that this story will inspire all of us to think again, to give inspiration, hope and dreams for aspiring athletes, people who are Deaf or Hard of Hearing and their communities, just about anyone and even those who aspire to be the best janitors they can. This a wonderful story that is well overdue to be told. Go and visit on Kickstarter and see his accessible videos which he explains why he wanted to do this, a sample list of chapters for his biography book and finally, give your support to make this happen!